WARNING: Stained Glass style T-shirt quilts are very expensive because they are a specialized product. Read more about Stained Glass T-shirt quilts here. 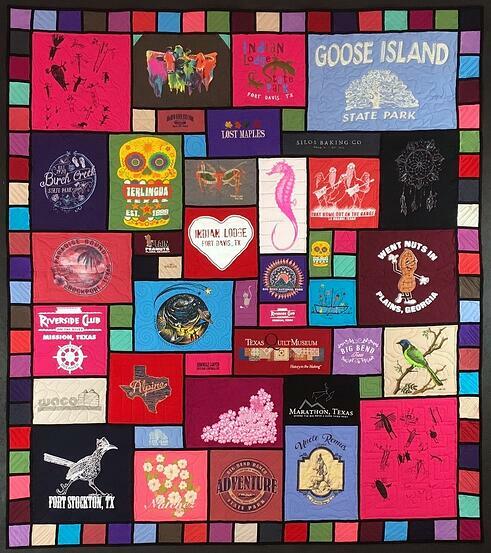 Here’s a link to our regular T-shirt quilts pricing. Since Stained-glass quilts are so expensive, we do require a deposit for half. We will let you know what the cost will be after we cut your T-shirts. Upon receipt of the deposit, we will be begin making the quilt. You cannot change your mind about what style quilt you will have made after we have cut your T-shirts. The two styles of quilts are cut differently. Once the T-shirts are cut, the style is locked in. We accept checks, cash, payment through PayPal or credit cards over the phone. When your quilt is finished we will e-mail you a ransom photo of your quilt and an invoice. Upon receipt of your final payment we will ship your quilt.